Very easy to spot the entrance to Yamabiko Ryokan (やまびこ旅館) if you are coming from Oguni by road,it`s the second on the left after the tunnel ,a little further along the road from Kurokawaso (Onsen-hop #1). Enter through the main gate ,reception is on the left then follow a walkway off the lobby to reach the outdoor baths. As it was lunchtime there were very few onsen-hoppers even though Yamabiko Ryokan boasts the largest mixed bath in Kurokawa. The baths are swapped over every day,but unfortunately today the smaller bath was designated as the women`s bath and the larger one as the men`s/mixed one. Everything was very neat and tidy,environment-friendly body wash is also provided. The waters were a beautiful shade of milky blue,and quite refreshing on this humid afternoon owing to the hydrogen carbonate spring waters (which can also soothe burns and help heal scars,says my guide). Lots of nooks and crannies to explore,a (free) foot bath,boiled onsen eggs, gift shop,lounge for relaxing,koi carp in the pond, and a huge black Newfoundland on guard at the entrance. The bridge over the river provides access to the main Ryokan accommodation,and things probably get quite busy around here once it gets to check-in time! How cool do you look in a Yukata? 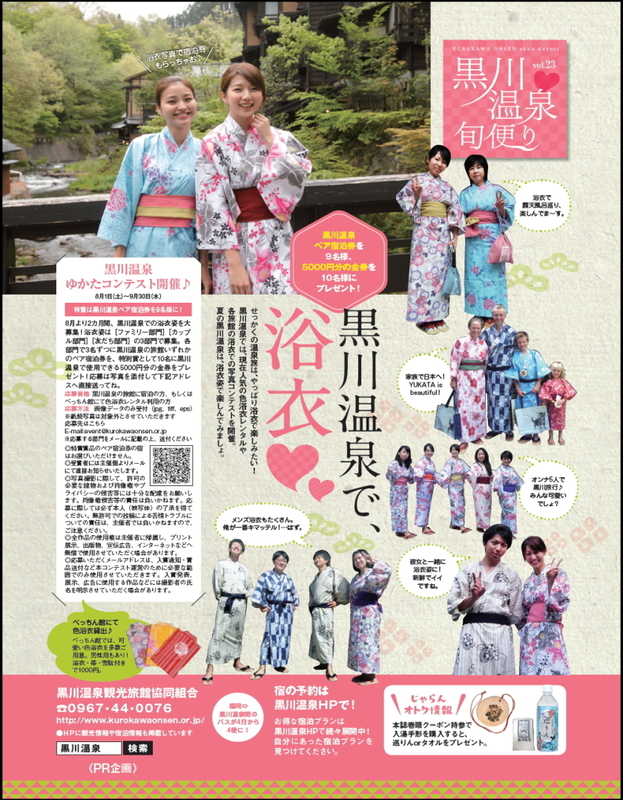 If you are staying in Kurokawa Onsen,or renting a Yukata from the `Bechin-kan`, before the end of September you can still enter the Yukata Photo Contest! and indicate if you are entering the `FAMILY` `COUPLE` or `FRIEND`category. Prizes in each category include accommodation coupons and 5000yen shopping vouchers! `Kurokawaonsen Kanshasai` festival schedule details Yukata Rental in Kurokawa Onsen `WELCOME KYUSHU` ONSEN CONTEST 2016. Please vote for Kurokawa Onsen! NEW Shared Onsen-hopping pass for groups!